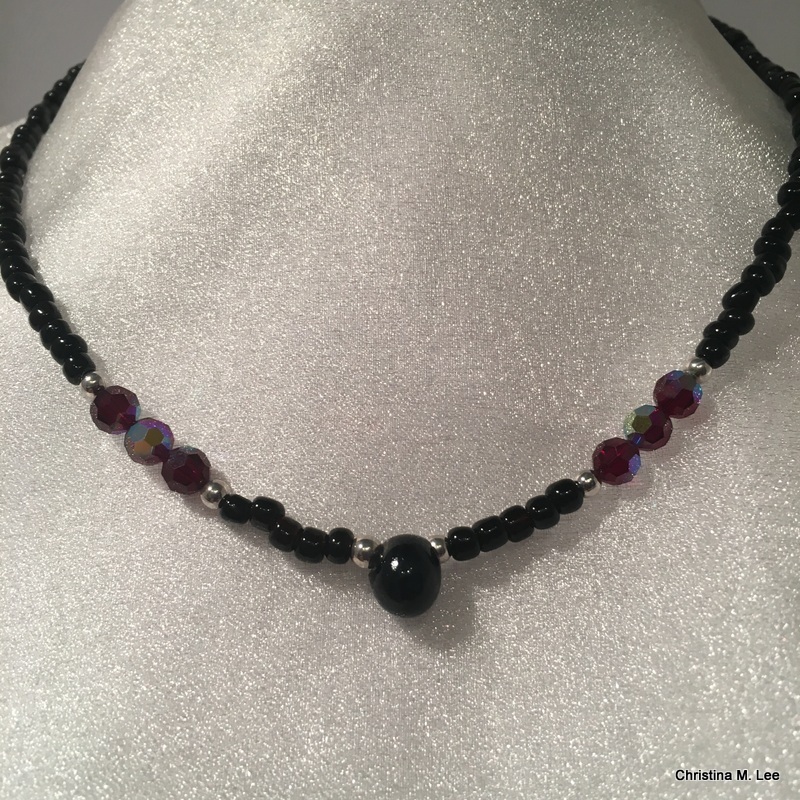 I AM CHRISTINA M. LEE, I DESIGN JEWELRY FOR WOMEN WHO WANT TO FEEL UNIQUE AND ELEGANT, EFFORTLESSLY. Village of the Arts at the Manatee County Chamber of Commerce Event. 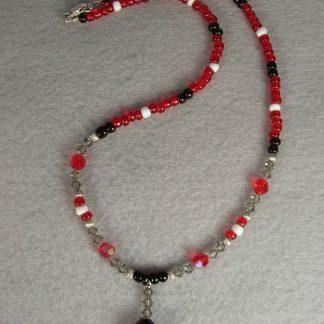 You need jewelry that is unique and elegant. 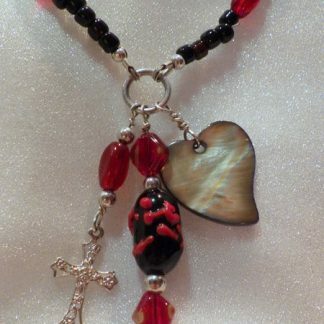 You need quality jewelry that is created with you in mind and that is fun to wear, yet will last. Jewelry that makes you feel beautiful every time you wear it, and feel elegant as you wear it, with little effort. That’s where my “ELEGANT ART YOU CAN WEAR.” comes in. 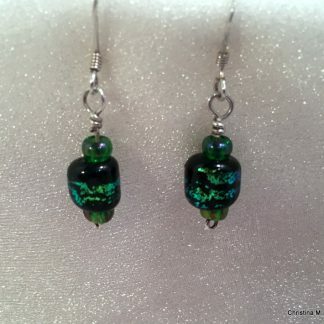 Trained in jewelry design, metalsmithing, glass fusing, lampwork glass bead making, and silk painting; and loving fashion, design and fiber arts, I am constantly thinking of ways jewelry and/or silks will make you feel elegant in your daily life with the simple ease of adding an accessory to your wardrobe. My degree is in Jewelry Design, working in silver and gold. 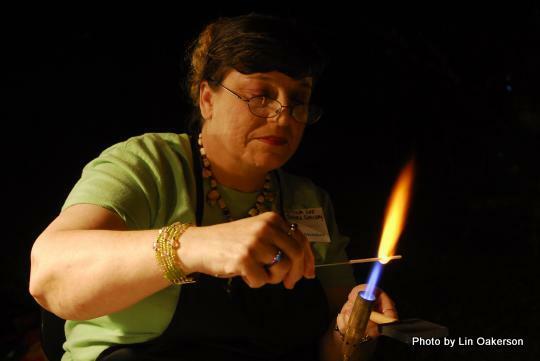 I added precious metal clay (PMC), fused glass, lampwork bead making and silk painting to my skills throughout the years. My husband laughingly says we have a foundry (4 kilns and multiple torches). I have also dabbled in fiber arts since I was a young girl, teaching myself to knit at 12 and learning crochet at 17 as a Foreign Exchange Student to Cyprus in high school. 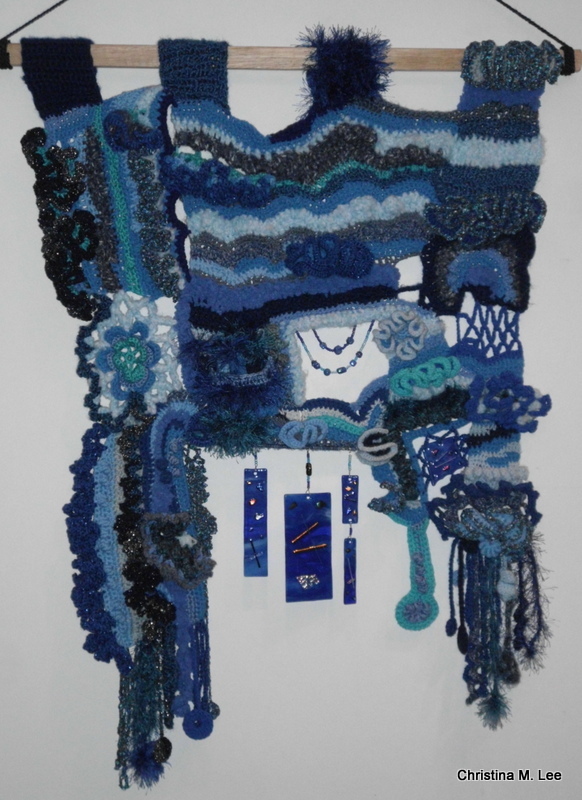 Every piece of jewelry, silk and fiber art are created by me here in my art studio, Lee Shore Studio, in Bradenton, Florida. Each piece is a one-of-a-kind original design. All silks and fiber arts are created in a pet free, smoke free environment, with your health and safety in mind. 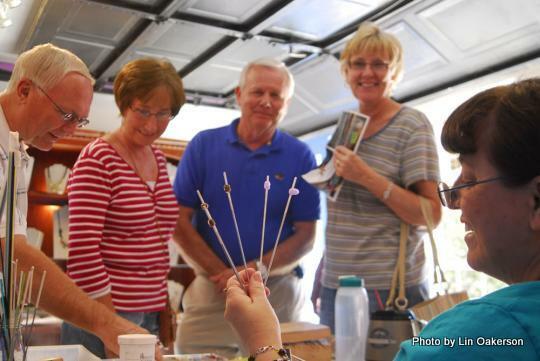 Village of the Arts, at the Village Studio Tours. 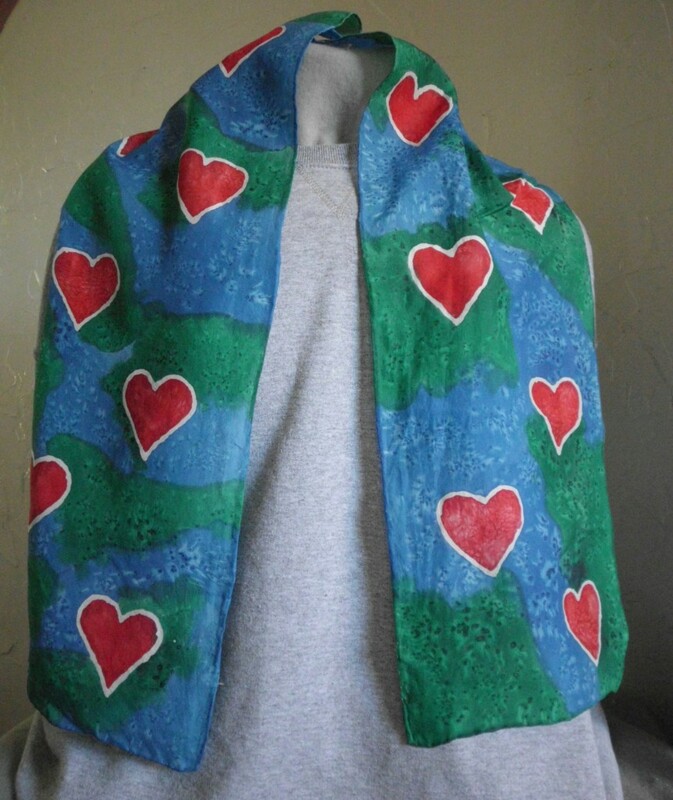 Original design scarf “Hearts”, hand painted on 100% silk. I also love creating original crocheted items and have my free Crochet Patterns posted here on my Blog, and on Ravelry and Craftsy. I discovered Free Form Crochet (crocheting without a pattern, creating as you go using different textures, types, and thicknesses of yarns, and different stitches), a few years ago, which is very relaxing and fun for me. My Free Form Fiber Arts creations have been published in the International Freeform Fiberarts Guild (INFF) annual Challenges for each year 2013 – 2017.
lampwork glass beads. ‘Blues’ has a home on my Dinning Room Wall. Created for the 2014 INFF Challenge. 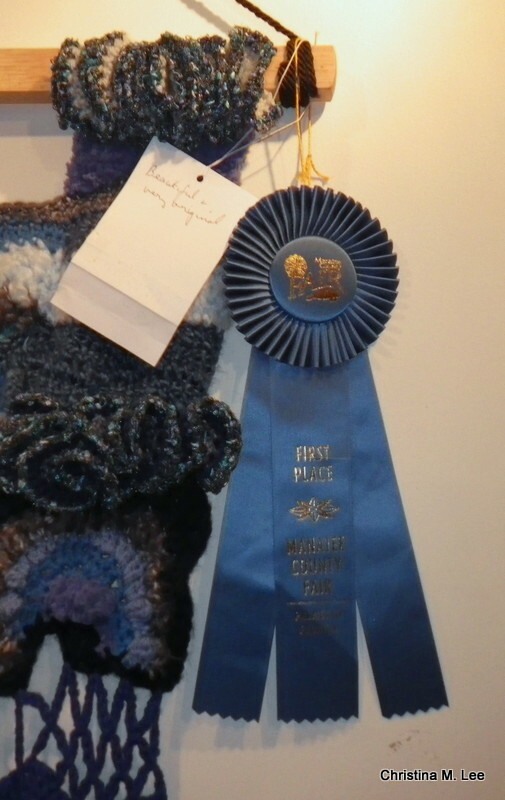 Blues won a First Place Rosette at the Manatee County Fair in January 2015. The Note on the back of my entry form written by the Judge says, “Beautiful & Very Original”. Wouldn’t your wall look lovely with an original fiber arts piece on it created especially for you to enjoy every day. My husband Rick and I have made our home in Bradenton, Florida for the past 22 years, and we love it here. We have been married for over 45 years. We have 2 children, a son and a daughter, grown and married, and 1 dear friend who is a daughter to us. They, and their wonderful spouses have given us 9 amazingly wonderful grandchildren and 5 great-grandchildren. We thoroughly enjoy being grandparents and spoiling them rotten! I love teaching art. (See my “Classes” page for more information on the Classes I teach.) We enjoy spending time with our children and grandchildren teaching them art, taking them to art shows, art museums and art galleries. They in turn love spending time with me in my art studio and being creative whenever they come to visit. My Husband Rick is a Musician and hobbyist Guitar Builder. He enjoys being creative too. 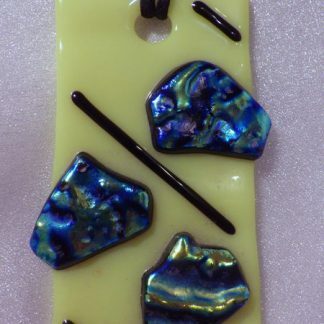 He also dabbles with some glass fusing and glass bead making. My husband and I have a very strong faith in Jesus Christ and we believe He is the One Who sustains us and Who has given us the talents to be creative. We are very active in our local church, The Family Church.